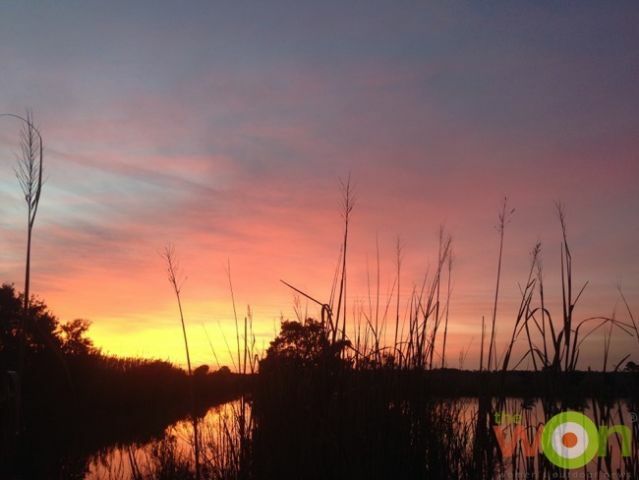 There are few things more exciting for a duck hunter than the last few moments before legal hour, when it is still a bit dark and the sound of beating wings and faint whistles fill your ears. You hunker down in the reeds and feel like you could burst with anticipation. When that duck hunt is in the saltwater marshes on the East Coast, the sunrise usually makes the trek to your hunting spot worth the work, even when there are no ducks. It’s those hunts that I absolutely adore, and I’m here with a few tips on how you can make the most of them, too. There’s a whole medley of locations and tactics when it comes to hunting in our saltwater marshes, from estuary bends just off main water channels that require a boat or layout blind, to hidden ponds deep within the marsh that can only be accessed on foot (and barely, at that). 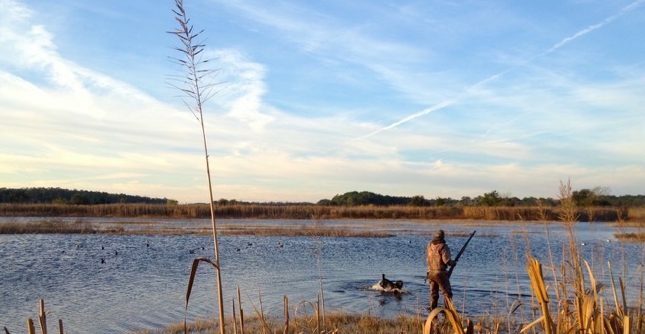 Many coastal hunting properties make use of old rice fields tucked at the edge of those marshes, flooding them and creating the perfect place for ducks to go. If you are going to hunt those tidal creeks, make sure you are very familiar with the area and its waterways, as well as the tide charts. It’s not a bad idea to check it out at low tide first, noting not only the depth, but also any oyster beds or pluff mud flats (trust me, you will sink). I’ve even taken a tumble in an old alligator nest hole. Make sure you’re not hunting in an area posted “Private” or “No Trespassing.” WMAs have specific hunting guidelines as well. Plus, when you’re a fair distance from shore and surrounded by marsh grass, sometimes you can only tell which way is up. Head out on foot, and a few hundred yards of marsh grass can seem like the middle of the Amazon. Throw in some hidden oyster beds and it’s a recipe for disaster before you even begin to hunt. It’s hard to tell, but there are actually several ponds hidden in this seemingly endless span of phragmites. These common marsh reeds can grow more than 15 feet high, so double-check your routes in and out to avoid getting lost. When it comes to camouflage, you’ll need to mimic phragmites. 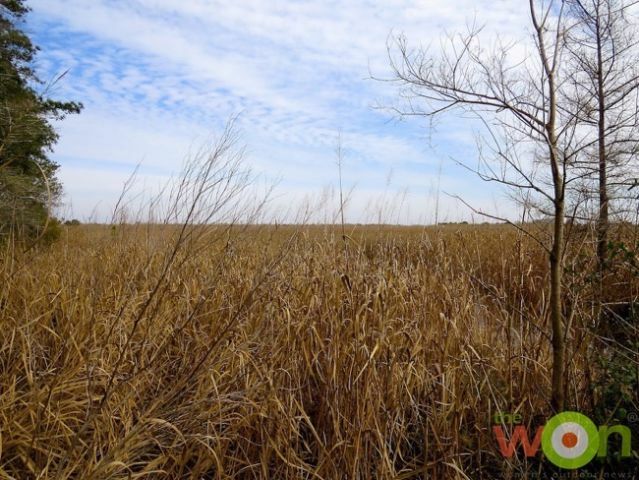 From your clothing and gear to your boat or blind, marsh grass is key. I’ve recently been working with the ladies at Girls With Guns, who have outfitted me with their Waterfowl Hunting Jacket (MSRP $199.99) for the upcoming season. I am so excited to put it to the test here in South Carolina’s marshy coast, since it will blend in perfectly with our terrain. As the season wears on and ducks become warier, an ill-camouflaged hunter, boat or blind will result in flared birds and fewer shot opportunities. If possible, leaving the boat behind (or foregoing it all together) and hiking in to your hunting spot will help minimize the conspicuous appearance of a hunter and dog to a passing duck. When there’s no blind or boat, just make use of the surroundings to hold your gear. I’ve been on plenty of duck hunts without the help of a bird dog, but this is one type of hunting that demands it. 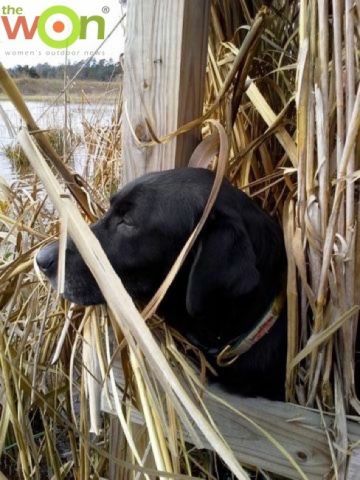 If you knock down a duck that lands in the marsh grass, your dog will be worth its weight in gold. 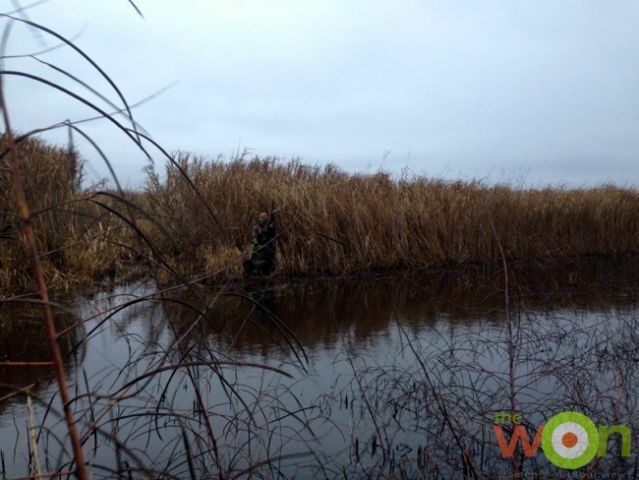 It doesn’t matter how good your shot was if you can’t ever find it, and when you’re faced with 20 feet of dense reeds in front of you, you could spend the entire hunt looking for that one duck. Even a few feet can be impossible for a person to get through (particularly in bulky waders), but a dog can wiggle its way through with little effort. On the other hand, setting up on the edge of a wide creek will undoubtedly result in a fallen duck landing in water well over your head. Without a helpful pup, you’re looking at a quick boat ride for every retrieve—otherwise, the tide will carry your bird wherever it pleases. In either scenario, having a place for your dog to sit or stand while resting is also important. Even a small, well-concealed platform will do wonders for keeping your dog safe and comfortable. Dixie quickly understood the need for some grassy camouflage! When it comes to decoys, I’ve found that a spread with some variety is usually a good tactic. Some ducks typically don’t decoy to a big spread of mallards, and you’re not likely to see only mallards, either. Hunting in these marshes and their surrounding areas will yield quite a melting pot of species—puddle ducks and divers alike. From big gadwall and black ducks, to fast ring-necks and tiny teal, it’s not uncommon to end a hunt with an assortment of ducks, and your decoy spread can help you accomplish that. 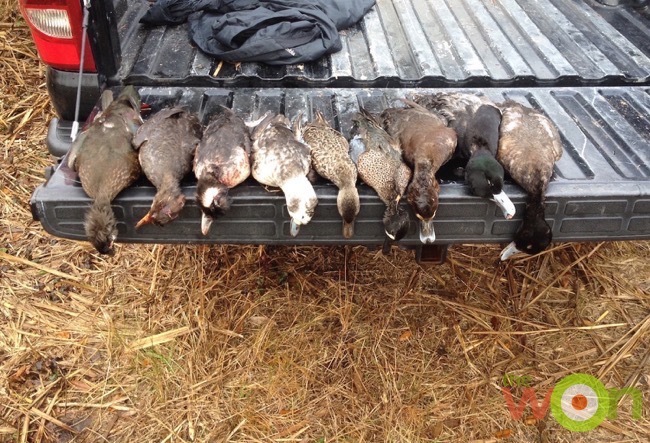 Three ducks shy of a two-man limit still provided an excellent mixed bag. Smaller ponds and potholes simply can’t hold a lot of ducks; while more open water might require a much larger spread, the little honey holes only need a few decoys to draw ducks in. Still, the key with decoys in either case is movement. While most coastal days have at least a light wind, it’s not a guarantee. Ducks are almost always moving on the water, so mimicking that movement is essential. 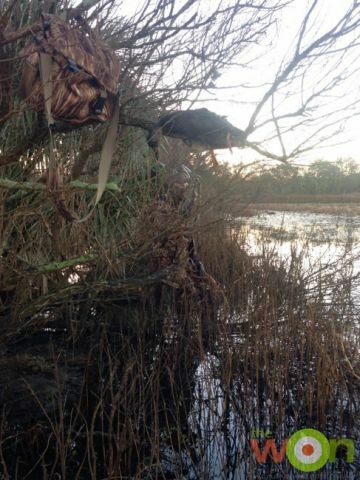 Flat water and stagnant decoys will raise a red flag for ducks flying overhead looking for a place to land, so make use of jerk strings or bubblers and other moving decoys (where legal) to keep a bit of chop on the water. Sometimes, that movement is all you need to get ducks to commit, without ever blowing a call. As for duck calls, less will often be more in these marsh-pond setups. Since you aren’t trying to draw ducks across an enormous lake or field, loud or aggressive calling isn’t necessary. A few basic quacks or greeting calls to let ducks in the air know where you are can do the trick. Or—similar to how you add variety to your decoys—throw in a whistling call to mix things up. At the end of last season, we drew in big flights of gadwall and widgeon with a few well-timed widgeon whistles. Full disclosure: I am terrible on a duck call. But I can manage a widgeon whistle by mouth without a call, so I can at least help out a little bit in the blind. My last bit of advice for hunting in coastal marshes is in regard to your gun. Whether you take a spill like I did in that alligator hole, or you and your gun stay high and dry all day, make sure you clean it after each hunt, no matter what. I’m not saying you need to completely take it apart every single time, but a good wipe-down and a coating of some Hoppes No. 9 Moisture Displacing Lubricant (MSRP $10) when you come out of the blind will certainly help keep your gun in working order. It’s amazing how quickly rust can accumulate in this salty, humid air, and it only takes a little bit to ruin a good gun…and subsequently a good hunt. 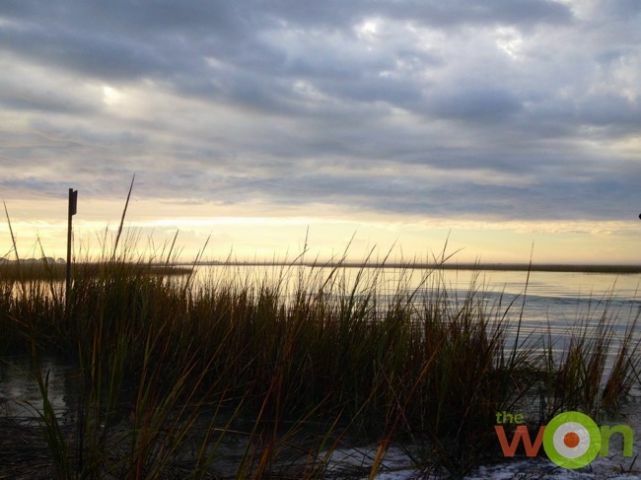 Trust me—one hunt out here in the marshes on the coast, and you’ll be hooked!